Has your sleep just been too pleasant and mundane recently, or do you enjoy a good fright? 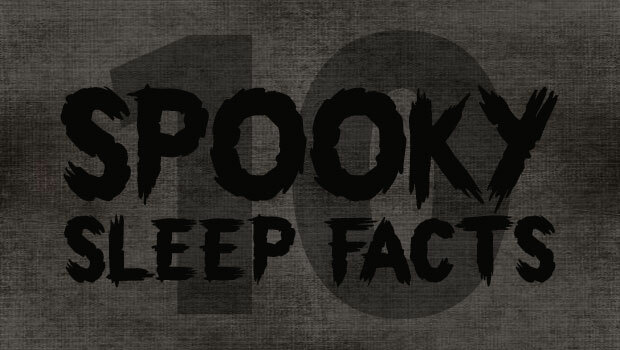 If so, keep reading to learn a few spooky sleep facts sure to make you think twice when drifting off. A combination of real tales, odd sleep disorders, and hard facts, these scary stories are the stuff nightmares are made of. You just woke up, and have a weird, eerie feeling. All of a sudden, you see a shadow flitting around your room. You try to move to rub your eyes, but you can’t; your body is frozen. The dark shadow gets closer and closer; you hear it breathing, you feel it touch you. It feels difficult to breathe. You question if you are still dreaming, but you know you are awake. Suddenly, the paralysis clears and the shadows vanish, leaving you pumped with adrenaline and extremely unsettled. When sleep paralysis and hallucinations combine, the result can be absolutely terrifying, experiences that may be the inspiration for several scary myths and movies. These hallucinations can take place when falling asleep or waking up, and typically have scary, threatening themes. Folklore has described these sensations as the work of demons, aliens or witchcraft, while modern science attributes them to delays in the body’s sleep-wake systems brought on by stress and sleep deprivation. Even more terrifying than the thought of waking nightmares: A narcolepsy sufferer who frequently sleep paralysis and hallucinations was somewhat used to lying semi-awake but unable to move, while thinking others were talking to him and making noises in his bedroom. One night, he awoke to the unthinkable. Waking up and expecting the usual, he realized that there actually was a real-life burglar in his bedroom. You just drifted off to sleep, and then suddenly you feel as if you are plummeting downwards, only to jerk awake before hitting ground. This sensation is a fairly common occurrence called a hypnic jerk. While science doesn’t know exactly why hypnic jerks occur, it is known that they take place during initial non-REM stages of sleep as muscles relax. Folklore has suggested several spooky causes for falling sensations. Some suggest that the feeling is caused by one’s spirit or soul leaving the body then being pulled back, or returning from an out-of-body experience. Other pop culture myths state that a person will die if they hit the ground before waking up. More scientific research has linked the falling sensations with stress, anxiety, caffeine, and irregular sleep schedules. Others theorize that this reflex goes back to the days when our ancestors slept in trees, and it may have served a purpose to prevent real falls. If you go to sleep late, you may end up the star in your own scary story. Midnight and the early morning hours hold spooky overtones, between the inherent unknowns of darkness and mythology of thing going bump in the night. While the witching hour itself likely isn’t the cause, studies have shown that twice as many night owls suffer from nightmares as those who are early to bed. Some scientists have speculated that levels of cortisol may influence nightmares as the hormone levels begin to rise in the morning. Other things tied to nightmares include stress, indigestion, medications, and certain physical/mental disorders. The idea of truly losing control over one’s physical body or actions is truly frightening for many people. Some types of disorders, like sleep apnea and REM sleep behavior disorder can cause your body to act out while you are sleep. Sleep apnea and REM sleep behavior disorder can interfere with mechanisms that keep our muscles still during sleep, causing sleepers to act out their dreams, possibly injuring themselves and bed partners as they act out violent or frightening nightmares. Even more unsettling, some researchers have linked REM sleep behavior disorder to later onset of neurological problems like Parkinson’s disease and dementia. Possibly even more spooky than involuntary movements, sleepwalking can put sleepers and others in real danger. Often described zombie-like, sleepwalkers may roam through the house, and even out the door without wakening. Types of sleepwalking have led to behaviors including injuring oneself or others, sleep-driving, sleep-eating and other unsettling things. There are numerous stories of sleepwalking people who have driven cars miles or have been accused of violent crimes with no conscious recollection. It has even been used as a defense in a few murder trials. Some research and anecdotal reports have noted some increases in sleepwalking which may have some relation to increasingly popular sleeping aids. While the phenomena is somewhat debated and nearly impossible to prove, many people claim that they are able to control their dreams. Called Lucid Dreaming, sleepers report that, with practice, they can recognize they in a dream and control many aspects of their dream world. Somewhat like Inception, people often have a cue to recognize their dream states such as something they try to touch, or perhaps even an external light or sound. Once in a lucid dream state, people report being able to conquer fears, soar through the skies, and work out real-life problems while sleeping. Some even say that they can start and stop dreams at their wish, and even repeat past dreams or pick up where they left off after waking. Nearly everyone is aware of the dangers of picking up hitchhikers, but what about the ones that you unwittingly bring home? The ones that leave blood spatters, carcasses and even feces in your bed when you think you’re alone? Biting like vampires in the dark, leaving holes in your flesh? While they don’t pose major dangers, bed bugs are quite unnerving and can be very costly to eliminate. They are becoming an increasing problem in many parts of the US, found in hotels, homes, and stores. Take measures to prevent them from infesting your bed like learning how to check for their presence when staying away from home, and thoroughly inspecting luggage and bedding. Feelings of suffocation or not being able to catch your breath are common signs of asthma, which can be frightening while sleeping. But were you aware that some of the triggers can be lurking under the sheets? Dust mites are considered one of the leading household allergens and can lead to breathing problems and reactions. Dust mites feed of shed skin cells and other detritus, and leave behind their droppings and dead. Since people spend hours in bed shedding skin, mattresses are a haven for mites. Older beds and pillows can be dust mite havens, contributing to allergies and asthma. Beds with large open spaces or billowy fiber/feather layers are most attractive. While it is virtually impossible to eliminate dust mites, frequent vacuuming and washing of bedding combined with mite-proof covers can help reduce mites and keep your room healthier. Many ghoul stories begin with the dank presences of mold and mildew in creepy caves, abandoned houses and mummy tombs, sometimes leading to odd illnesses. Unfortunately many mattresses also contain mold and mildew that can be difficult to destroy and can lead to real health problems. Mold is most common in humid areas, or in beds of people who sweat excessively or where liquids have been spilled. Look for signs of dark spots on the surface and the bottom of the mattress, or odors that never go away. Certain types of molds produce toxic chemicals and spores that have can have extensive health effects on humans, especially children, and should not be ignored. Some symptoms include fatigue, sleeplessness, breathing troubles, digestive issues, pain and more. Using waterproof mattress covers, dehumidifiers and taking precautions to avoid spills are a few ways to reduce the likelihood of mold in your bed. Perhaps some of the creepiest sleep information is what a lack of sleep can do to people. While scientists have not yet proven precisely why we spend one-third of our lives asleep, we do know that rest is something that people and mammals cannot live without. While studies have not been conducted on exactly how long humans can go without sleep for obvious ethical reasons, lab rats tend to die after two weeks of total sleep deprivation, and a very rare condition called Fatal Familial Insomnia deprives the afflicted from sleeping, who die within 6 to 30 months due to organ failure and nervous system deterioration. Under sleep deprivation, generally classified as less than 5-6 hours per night, there are both severe mental and physical changes that occur. Mentally, you become moody, reactive and unbalanced – essentially a Hyde to your normal Jekyll. You also have more trouble with memory, coordination and reflexes, which can impair your ability to drive and work. Physically, sleep deprivation increases risk of stroke, cancer, diabetes and osteoporosis, and affects heart health, can increase future risk of Alzheimer’s, and can cause excess weight gain. Some studies have even shown actual genetic changes after even one-week. Enough to scare you straight to sleep! Sleep is supposed to be a time of peaceful relaxation and renewal, but for many sleep is the scariest part of the day. Our innate fears of vulnerability during sleep are easily exploited by scary movies, spooky stories, and self-defeating sleep disorders. But, knowing the real causes behind spooky sleep facts can be helpful for overcoming anxiety and preventing problems. If you think you have a sleep disorder or have overwhelming anxiety about sleeping, consulting with your physician is recommended over reading scary stories online ;). Sleep tight, and don’t let the bedbugs bite! I thought this was so Great! I’m now writing a report on this thanks to this article! It was so informal and mysterious, I would definitely recommend reading about the mandela effect as well! t’s almost like Hypnic jerks but your not fully asleep yet? Like your just about to fall asleep and you have a full body jerk and suddenly your wide awake and its like midnight? but you went to sleep earlier but you have no recollection of actually falling asleep so you were most likely awake or is that just me? I feel too many hypnic jerks during my sleep. I get a sensation that I am falling from a height. But sometimes it is worse as I can feel some other dangerous entity besides me in my room which is trying to communicate with me or tries to harm me. I once suddenly woke up at midnight maybe coz of a nightmare. I saw a figure in front of me . it was someone i knew but suddenly the face changed, i hid my face under my blanket and after 2 minutes when i checked if it was still there, it was. it stood still staring at me. i tried to shout but i couldn’t. i wasn’t able to utter a word or move. after sometime i automatically felt asleep and woke the other day. I can mostly control my dreams too. I thought it is so cool since people around me cannot. This article made me feel like its a common thing. Didn’t know it was something a lot of people could do. Haha! Still feel like a special case though. I dont know about stress being the cause of this Night Terror.. I woke up with an un-easy feeling. As I reached for my partner at the other side of the bed. I could not find him there. I noticed a Shadow Leave the Room. While I waited for his return, I slowly wriggled over to where he sleeps, to find he was still there… and HE was Scared Stiff!!! When I asked him about what just happened, He said someone was standing over him!! .. With a Hand around his Throat!!! He didnt stay at my house again for months!! I believe I saw it (the Shadow) leave the room..
What kind of stress creates a halucination that is shared with another at waking hours? I do not blame stress, instead something unexplainable, something otherworldly maybe.